Lasagna without the noodles. It’s a thing in my life. 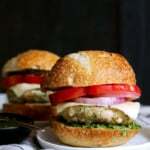 A very delicious thing that I needed to share with you just in time for eggplant season! Let’s back up a sec though. Before I share the recipe details with you, I must tell you about my lasagna obsession. Flashback to around my 21st birthday when I asked my Mom to make me lasagna. First of all, three days prior to my birthday I had returned to America from my adventures wine drinking and traveling around in the land of Oz, so my 21st birthday didn’t seem all that exciting. On the other hand, my Mom was THRILLED. She wanted to make me something special for my birthday and asked for requests. I think she was expecting me to say enchiladas (I always request them), so when I asked for a vegetarian lasagna she was shocked. However, being the lovely mother she is, she ended up making me the BEST LASAGNA EVER. It was a giant 9×13 inch pan loaded with spinach, butternut squash, mozzarella, parmesan and whole wheat noodles. I ate two slices and refused to share with anyone else. Seriously refused. I kept the leftovers in my freezer and ate the rest every day for a week. This story needed to be shared because it’s what started my lasagna obsession. From that moment forward, I started remembering every time I ate lasagna. From the first time I met Tony’s parents to the last family Christmas party, I never forget a lasagna. 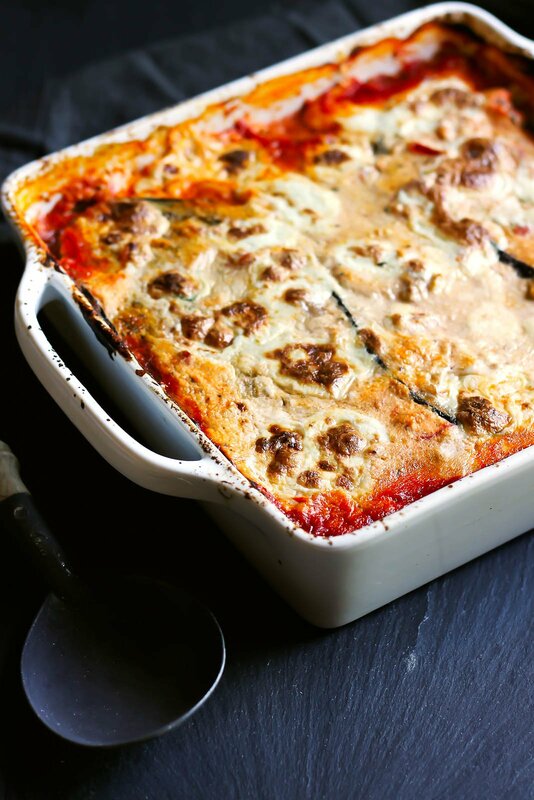 And now we’ve got this eggplant lasagna to remember! 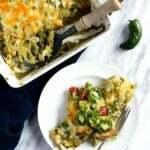 This particular recipe is based off my no noodle zucchini lasagna, which is basically layer upon layer of zucchini, cheese, meat and sauce. Oh me likey. Me likey a lot. 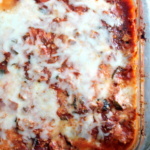 Eggplant lasagna could be my new favorite though, mostly because of the insanely good turkey meat sauce. OH MY GOD. Just make the sauce and ladle it in your mouth. (Or of course you can make the actual recipe.) I am declaring this my famous turkey meat sauce. Hopefully you’ll agree. Anyway let me quit jabbering and explain the whole lasagna process here! First we’ll make the epic most famous Ambitious Kitchen turkey meat sauce. Yes, you’re going to put on your fancy pants and make your own sauce. It’s a game changer in the lasagna world. 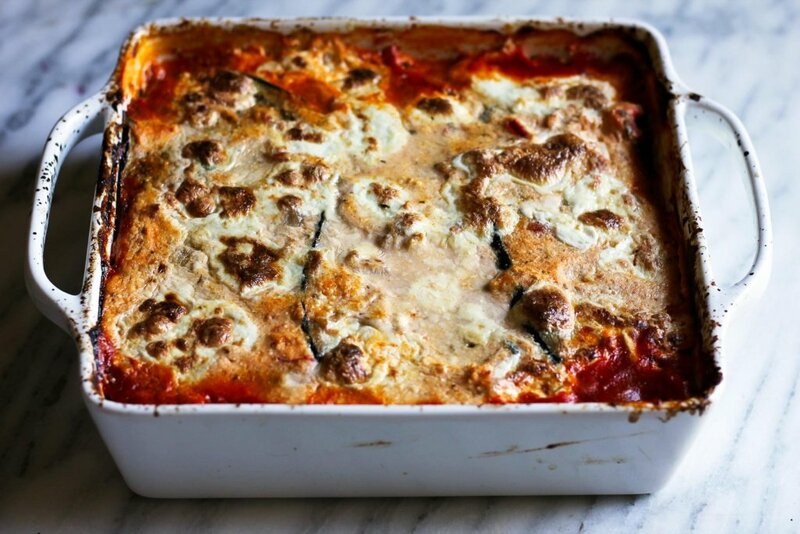 While that’s simmering up, you’ll bake the eggplant. I highly recommend peeling the eggplant after you bake it, or just cut off the skin because it can be tough to cut through in the lasagna. As you can see I didn’t cut it off, but I noted in the ingredients that you should. After that’s done, you’ll do a layer of meat sauce, eggplant, ricotta and burrata. The burrata makes things incredibly creamy, but if it’s not your thing, fresh mozzarella is an excellent substitute! Bake until bubbly. Broil at the end to get the cheese on top nice and golden brown. DIG IN! If you make this recipe, be sure to upload a photo to Instagram and tag #ambitiouskitchen! Thank you for being here with me, I love you guys! 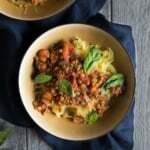 This noodless version of eggplant lasagna is a wonderful low carb dinner. Made with a rich italian turkey meat sauce and three cheeses! Everyone will love this. Place olive oil a large dutch oven or pot over medium high heat. Once oil is hot, add in turkey, onion, bell pepper and garlic. Break up the turkey and cook for 5-8 minutes or until turkey is no longer pink. Next add in diced tomatoes, tomato paste, water, basil, dried oregano, fennel seeds, salt and pepper. Stir until well combined then reduce heat to low, cover and simmer. Stir every few minutes. 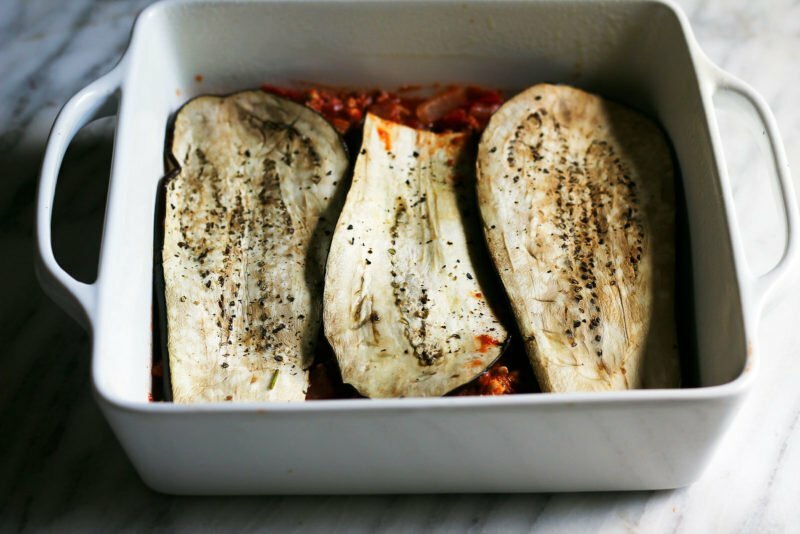 Place sliced eggplant on large baking sheet coated with nonstick cooking spray. Sprinkle with salt and roast in the oven for 10-15 minutes to help dry out the eggplant a bit. This is a critical step. After eggplant is done cooking, remove or cut off it's skin. 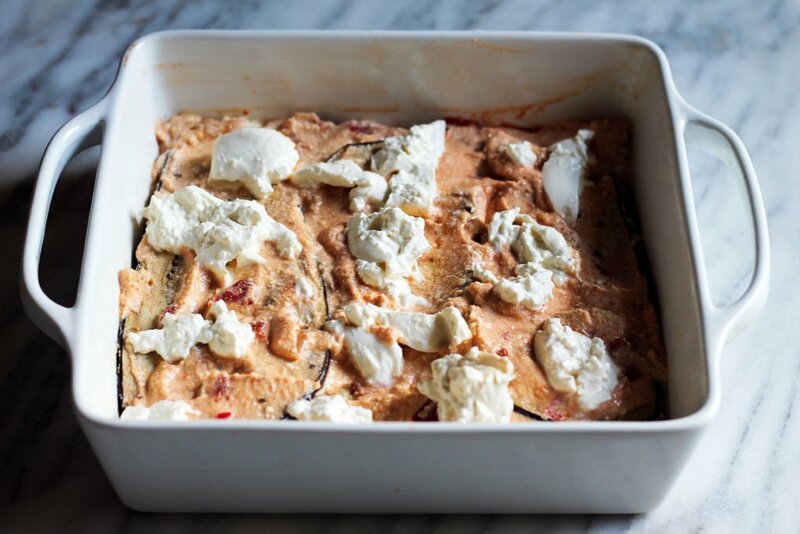 While eggplant is cooking, you can mix together the ricotta, parmesan and egg in a medium bowl until well combined. Once eggplant is done cooking, remove the turkey meat sauce from the heat and allow to cool a bit. After it has cooled off for a few minutes, add 1/2 cup of meat sauce to the ricotta mixture. To assemble lasagna, spread 1/2 of the turkey meat sauce into the bottom of a 9x9 inch baking pan coated with nonstick cooking spray. Place half of eggplant slices evenly over meat sauce, spread on 1/2 of the ricotta mixture, then break apart half of the burrata and drop on top (I just cut up the burrata with a knife). Repeat layers again starting with the meat sauce, eggplant slices and ricotta mixture and finishing with burrata on top. 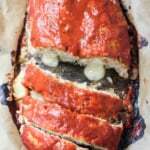 Cover with foil and bake for 40 min. 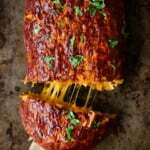 Remove foil and broil for 5-10 minutes or until cheese is golden brown and bubbly on top. Serve with a side salad. Serves 6. 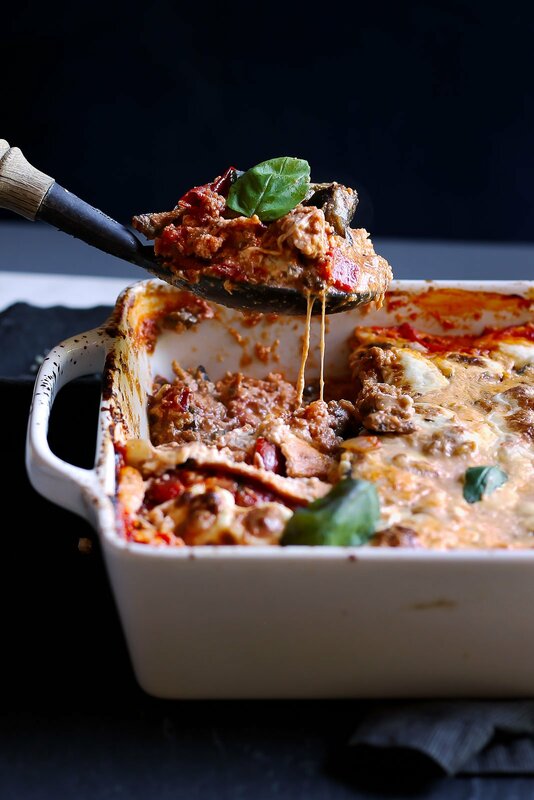 36 Responses to "Low Carb Eggplant Lasagna with the Best Turkey Meat Sauce + Burrata"
Burrata AND ricotta in this lasagna?! MY DREAM. you need to share the recipe your mom made you! 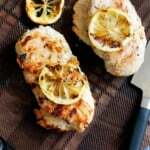 I tried out this recipe and loved it. I completely agree with you that your meat sauce is out of this world. I did not use turkey , but used lean ground beef and added a bit of spice to it.It was still amazing, my grown up boys (should I say men) thought so too. Thank you for this recipe. 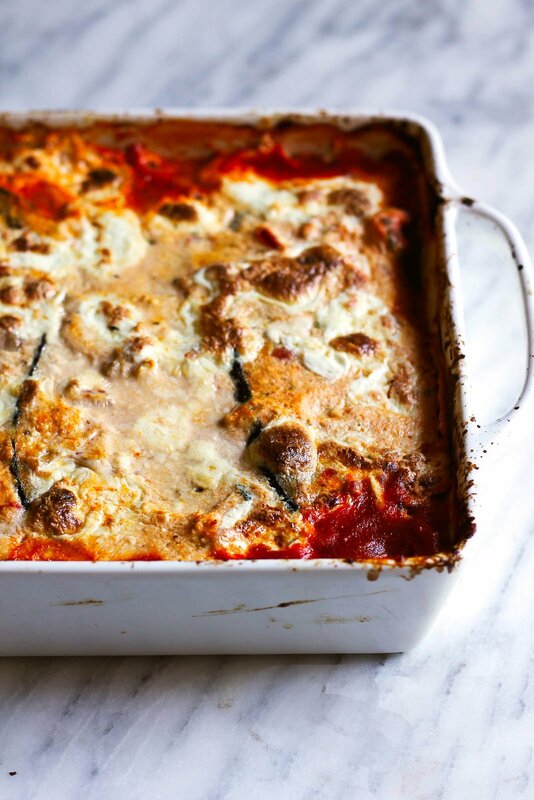 Italian-style eggplant NEVER gets old. I just love it with tomato sauce so much–and the combination with turkey, oregano and red bell peppers make it ten times better! I made this the other night–SO delicious. Skipped the parm, used jarred tomato sauce (I was in a rush! ), and regular old mozzarella and it was fab. You’re right, roasting the eggplant beforehand is key. Thank you for a killer recipe! This was delicious. I also couldn’t find burrata and used fresh mozzarella. I had 3 medium eggplant given to me from a neighbor’s garden. I also didn’t have a 9X9 baking dish, but used a 9X13 silicone pan. Even with the eggplant being a bit scarce and spread out, my husband and I both enjoyed it. Hehehe He’s always said he doesn’t care for eggplant! Keep up with the great recipes. I’m so glad I found your blog. I made this tonight and it was awesome! Only one suggestion, add red pepper flakes to punch it up a little. Lisa! So happy to hear that 🙂 Thanks for your note! Hi Michele! You should be able to print from desktop – we’re just working on a fix for printing from an iPhone.